In Europe, the “other” are immigrants, largely of Muslim origin, whom populist right parties see as threatening traditional Western ways of life (de Lange and Mügge 2015). 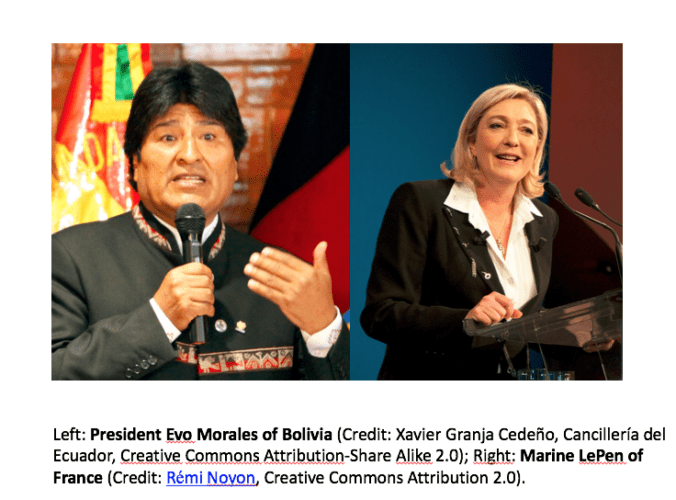 As a result, the gendered implications of populist mobilization in Western Europe have varied considerably from those in Latin America. In particularly, populist movements and parties across Europe have turned their attention to gender equality (at least insofar as it benefits white women), claiming that Muslim immigrants pose a threat to women’s equality and freedoms and citing forced marriage, child marriage, and honor killings as examples of anti-women and anti-Western values (De Lange and Mügge 2015; Meeret and Siim 2013). Le Pen offered an illustrative example when she evoked feminist writer Simone de Beauvoir in an op-ed, citing the sexual assaults of Cologne on New Year’s Eve 2015 to argue that Muslim immigrants threaten the bodily integrity of European women. What, then, does this mean for the future of women’s political representation within populist parties? In Latin America, support for populist parties is declining, rather than rising. Right-wing, neoconservative, and decidedly not populist governments are dethroning leftists throughout the region. The gender-equality gains of left-wing populist governments, especially in terms of women’s political representation, appear under threat. Indeed, one of the first actions of the new Brazilian president was eliminating the Ministry of Women, Racial Equality, and Human Rights.